Waiting Barack Obama UFO Disclosure: Col. John Alexander has one goal: amnesty to anyone in the military who has been previously sworn to secrecy about UFOs. 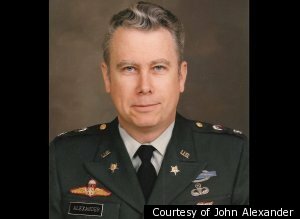 Title: "UFO Amnesty: Ex-Army Colonel John Alexander Seeks Amnesty For Military Who Witness UFOs [EXCLUSIVE]"
"If you're in the military and have ever seen what you believe to be a UFO, but were reluctant to mention it for fear of ridicule or, worse, repercussions that might end your career, take heart. Things may change. A former military insider with top secret clearance who created Advanced Theoretical Physics -- a group of top-level government officials and scientists brought together to study UFO reports -- has just called on three of the highest-ranking military and intelligence officials in the Obama administration. Retired Army Col. John Alexander has one goal: to ask Secretary of Defense Leon Panetta, CIA Director Gen. David Petraeus and National Intelligence Director Gen. James Clapper to offer amnesty to anyone in the military who has been previously sworn to secrecy about UFOs. "The issue has to do with this [notion of] disclosure," said Alexander. "The assumption in the UFO community -- and, frankly, the general population -- is that UFOs are secret and all the information is automatically classified. My position is that is not true." Revealed exclusively to The Huffington Post, Alexander has sent letters to Panetta, Petraeus and Clapper, in which he proposes a no-cost, win-win solution for enhancing the U.S. government's trust and confidence with the American public. He's specifically referring to Unidentified Flying Objects. A leading advocate for the development of non-lethal weapons, Alexander commanded Special Forces "A" Teams in Vietnam and Thailand in the 1960s. As a program manager for Los Alamos National Laboratory, he conducted non-lethal warfare briefings for the White House staff, National Security Council, members of Congress and senior defense officials. "My supposition is that A) there's no policy of [UFO] secrecy; and B) there are agents out there who think they're supposed to keep it a secret, so they're basically winging it. In other words, it's easier to tell you to sit down and shut up then it is to figure things out," Alexander, author of "UFOs: Myths, Conspiracies and Realities," told HuffPost. Alexander spent a quarter of a century maneuvering through top levels of the U.S. government and military, searching for the supposed decades-long UFO cover-up. Not only could he not find a cover-up, Alexander came away from his investigation convinced UFO disclosure has already occurred on many levels. •Some UFOs are real and of unknown origin. • About 5 percent of all sightings remain unexplained. • Many sensor systems do have anomalous recordings. • There are numerous UFO sightings reported by highly credible observers. • There have been incidents involving interactions between UFOs and military systems. • There have been interactions between UFOs and airplanes that raise safety issues. • Over 70 percent of American adults believe the U.S. government is covering up information on the topic. • Polls indicate that 20 percent of the global population believes aliens are here on Earth and living among us. Alexander will publicly announce his amnesty request to the government this Thursday, when he appears at the National Atomic Testing Museum in Las Vegas, Nev. The museum is the 37th and newest national museum of the United States. It tells the story -- in an in-depth walking tour -- of nuclear testing for America's atomic energy program, which began in the Nevada desert in 1951. Interestingly, this is a Smithsonian-affiliated museum that includes a recently unveiled exhibit about Area 51 -- considered the most top secret military testing facility in the country -- and contains UFO-related displays, including one entitled "Authentic Alien Artifact." Museum CEO and executive director Allan Palmer says it's important to have Alexander speak about the need to get the word out to military personnel who would like to talk about UFOs but have been reticent for many years. "I have known people who've seen things they couldn't explain and were very reluctant to talk to anybody about it," Palmer, a highly decorated former Air Force and Navy combat jet fighter, told The Huffington Post. "The reason is because we all had very high-level security clearances," he said. "Just the mention of seeing something that you didn't know or you thought might be a UFO would be enough for a visit with the flight surgeon, if not the psychiatric staff at the base hospital. "And that would be reason to pull your security clearance, at least temporarily, which means that you wouldn't be flying and that would be a black mark on an aviator's record. Seeing a UFO show up on your base could be perceived as [your] being unstable. At least as far as retribution or career penalties, if things could be lifted or suspended, that would probably help the process." In the letters sent to Panetta, Petraeus and Clapper, Alexander states that former military personnel "claim that they are bound by security oaths to never reveal the information or have been overtly threatened by government officials. Even death threats for divulging UFO information are reported." Alexander points out to the three government officials that occasionally "some level of secrecy has been invoked on U.S. military personnel." He cites the case of Air Force pilot Milton Torres who was ordered to fire missiles at a gigantic UFO that appeared over Great Britain on Sept. 20, 1957. "He was ordered to remain silent," Alexander reminded the officials. "Threatened with losing his wings by an unknown official, Torres complied until the U.K. Ministry of Defense released the files in 2008. No U.S. report on the incident has ever been found. From many other instances, it appears that security personnel periodically have warned/threatened both military and civilian people about reporting UFO information." Alexander isn't looking to get the government to reveal that some UFOs may be extraterrestrial craft. He only wants to promote an environment in which members of the military feel comfortable talking about their experiences. If an official letter of amnesty were to come from Alexander's efforts, he suggests the results could go in a couple of directions. "I would think there'd be some who have information and believe they shouldn't talk about it who would then feel free to do so," he explained. "Conversely, I think there are some others who've been frankly making up stories and saying they have been threatened that will then either have to come forward and explain it or, more likely, will evaporate and run for cover."